Seeking some elbow room inside & out? 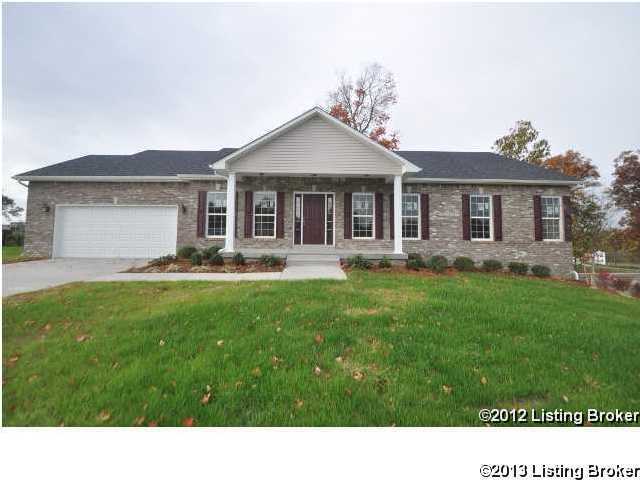 Call today for a tour of this dynamite new ranch home! Open great room and kitchen, formal dining, lots of closets throughout including two walk-ins in the master suite. Gorgeous hardwood flooring, main level laundry room with sink and more! HUGE family room in the walk out basement, as well as a spacious bedroom, full bath and 22x16 unfisinshed storage room! Covered rear deck and front porch, and WOW-you will love the kitchen from cabinets to granite! Direction: 31w to 220 to turn-about Rineyville, first right on Thompson Rd, to left on Follow back to Grace court on the right. House on right, sign posted. 92 Grace Ct, Rineyville KY 40162 is a Home, with 4 bedrooms which is recently sold, it has 3,259 sqft, 1 sized lot, and 2 Car Garage,Attached,Entry Front parking. A comparable Other, has bedrooms and 0 baths, it was built in and is located at and for sale by its owner at $ 0. This home is located in the city of , in zip code , this County Other, it is in the Subdivision, and LAVISTA ESTATES are nearby neighborhoods.